Here in Bari the weather is always good and there's just so much stuff to do. Azzurra is a comfortable, romantic sailing boat. With 34 foot of length, it has 3 cabins (one of which is used as luggage), a convenient toilet, an internal and external shower (with hot and cold water), a dinette with a sofa bed and wide external areas where you can have lunch, sunbathe and listent to music or listent to the charming festival of the wind. You will live a fascinating sojourn staying in the centre of the city but without the rules of a hotel (or holiday flat) and without the stressful parking pressure! 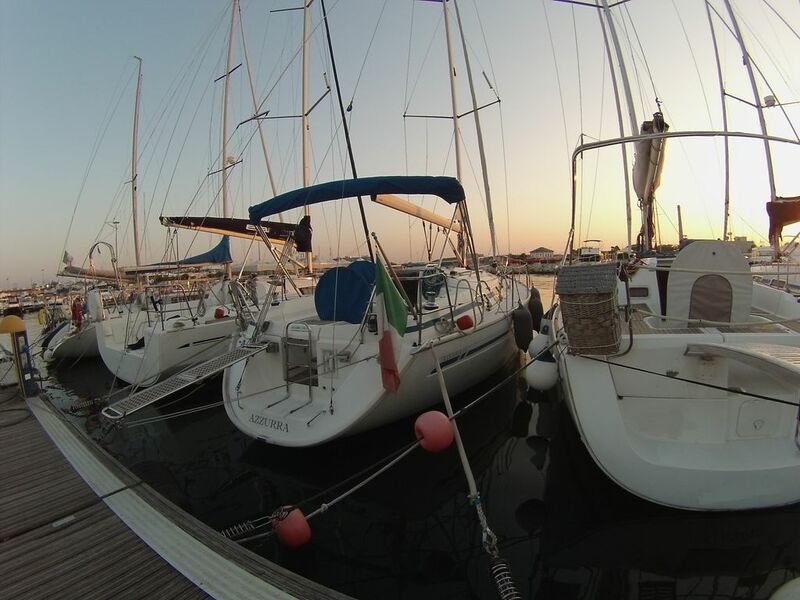 During the wintry period, Azzurra is well warmed up, you could watch stars from the portholes, drink an infusion and wake up early to do some footing on the atletic track of the wet dock and then go around in the old city. Azzurra is moored in the most beautiful wet dock of Bari. The marina is provided with sailing school, clean sanitary services, showers, wifi. This area is 20 minutes far (by foot) from the HISTORICAL CENTER of Bari, made of alleys; these alleys are characterized by the smell of cleanliness and of the typical food of Bari. For example you could pass through the “streets of orecchiette” where old housewives prepare with mastery the “strascinate” (fresh homemade pasta). It will be possible also to visit the Cathedral of St. Sabino , the St. Nicola Basilica and Castello Svevo. In the Marina available to guests there are 2 bicycles. It will be possible, to do daily yachtings, to fish “tombarello”( a type of tune), to moor in the inlet in front of st. Nicola’s Basilica and also to sample the typical tasty “focaccia barese” and fresh mozzarella. Alternatively, we could organize a mini cruise to reach the port of Trani and visit the cathedral of this city, or Polignano a Mare , with its suggestive cliffs. If you want, we will be happy to involve you in the boarding rigging and explain you the first approaches with wind and sailes. If weather won’t be accessible and won’t allow us to stay on boat, we could organise guided tours with a comfortable Mercedes E Station Wagon. It will be possible to reach wonderful places like “Grotte of Castellana” , “trulli of Alberobello”, “Valle d’Itria”, “Castel del Monte” or Matera (Unesco World Heritage Centre since 1993), city of “sassi” whose origins are reachable in the prehistory and for this reason considered as one of the oldest urban centers in the world. Also there, we could taste the fantastic Apulia food in some masserie and typical Our sailing boat, although is very comfortable, has a limited space. Therefore, we suggest you not to bring stiff suitcases on board, but comfortable and flexible bags in order to place and move them easily. I have always shared the love for the sea and cruises with my wife, so since October 2016 we have decided to transmit this passion to new friends. We would like to see and to be spectator of the feelings and sensations of people who climbs on board for the first time. We will be happy to host you and take care of your wellness; we will be happy to give you advices about tours and potentially, come with you. We have very few reviews for the moment, but we have good will to conquer them. Be patient if our English is not so good. Please talk slowly, we will improve our language skills thanks to your help. In return we will give you an unmatched hospitality. If it is necessary and you need a lift, with a small surcharge, we could greet and welcome you to the airport (or station) of Bari. I am a avid sportman, frequent cultural and sports associations. I love life and people who smiles.Curiosity is the lymph of my life, i like to learn and i like to transfermy knowlwdge. I live in Bari, and of this beautiful city i know the virtues and the defects. To make unique every moment of your vacation, is been born an idea. I have always shared the love for the sea and cuises sailing with my wife, so now we have decided to transmit this passion to new friends. We woud like to see and to be spectator of the feelings and sesnsation of the people who climbs for the first time .We will be happy to host you and take care of your wellness. Azzurra is moored in the most beautiful marina of Bari. This wet basin is supervised and protected and it is provided sailing school, clean sanitary services, showers. This area is 20 minutes far (by foot) from the historical center of Bari, made of alleys; these alleys are characterized by the smell of cleanliness and of the typical food of Bari. For example you could pass through the “streets of orecchiette” where old housewives prepare with mastery the “strascinate” (fresh homemade pasta). It will be possible also to visit the cathedral of St. Sabino , the St. nicola Basilica and Castello svevo. Tolles Boot, Ausstattung ist zweckmäßig,ausreichend und sehr gemütlich. I cannot praise Vito and his wife enough. This was a wonderful experience, well beyond our expectations. Vito collected from the airport and returned us to the airport after our stay. Vito and his wife took us out for a day's sailing on their lovely boat and the lunch - food and wine they provided was a wonderful - real Italian home cooking. Vito lent us bikes and using the cycle path immediately outside the marina entrance we were able to explore the old town of Bari only a few minutes ride away. Sleeping on the boat was wonderful, peaceful and all we could have imagined. Despite their modesty about language skills they spoke excellent english ! Special guests were you! Thanks for all! Thanks also for the respect you have had for our boat. We would like all of our guests to be like you. Many greetings to Teresa. Azzurra è ormeggiata nella più bella marina di Bari città,sorvegliata e sicura, con all'interno bar ristorante, bagni e docce. A pochi passi dalla marina ci sono le modernissime piscine comunali, la spiaggia attrezzata, ristoranti tipici con specialità piatti di pesce e pizzerie; potrai visitare e fare shopping da Eataly, la catena delle prelibatezze gastronomiche italiane. All'interno della darsena c'è il centro di informazione dove ti indicheranno tour privati , per visitare i vari patrimoni dell'UNESCO come I trulli di Alberobello, i Sassi di Matera, con la Valle d'itria, le grotte di Castellana, Martina Franca, Polignano a Mare, Castel del Monte, Trani. E possibile noleggiare biciclette, e auto. L’uso della cucina e’ solo per la prima colazione ( the - caffe’ - latte) .